Overview - After directing two of the most extraordinary movies of the 1970s, Badlands and Days of Heaven, American artist Terrence Malick disappeared from the film world for twenty years, only to resurface in 1998 with this visionary adaptation of James Jones’s 1962 novel about the World War II battle for Guadalcanal. A big-budget, spectacularly mounted epic, The Thin Red Line is also one of the most deeply philosophical films ever released by a major Hollywood studio, a thought-provoking meditation on man, nature, and violence. Featuring a cast of contemporary cinema’s finest actors—Sean Penn, Jim Caviezel, Nick Nolte, Elias Koteas, and Woody Harrelson among them—The Thin Red Line is a kaleidoscopic evocation of the experience of combat that ranks as one of cinema’s greatest war films. There were two World War II movies released in 1998. Both were nominated for a slew of Academy Awards. But they couldn’t have been more different. The first, released that summer, was Steven Spielberg's 'Saving Private Ryan.' Embraced lovingly by critics, it was a weird kind of feel good combat picture: once you get past its admittedly awe-inspiring technical virtuosity (exemplified by the opening D-Day beach sequence that is the very essence of harrowing), the movie about a school teacher (Tom Hanks) and his band of misfit infantrymen rescuing a lone soldier, was plotted like a boys adventure story, and hamstrung by moments of big-hearted, soft-focused sentimentality. This film ended up winning Spielberg another Best Director Oscar and the hearts and minds of the populace because of its easily digestible message, oversized action beats, and star wattage (the titular private, we must remember, was Matt Damon). It didn't ask too many uncomfortable questions, or get too in your face about the queasiness of war. But it did ask you to cry. The second movie, released closer to the end of the year, was Terrence Malick's 'The Thin Red Line,' the reclusive director's first feature since 'Days of Heaven,' some 20 years earlier. A metaphysical war movie centered around the battle of Guadalcanal (which, true to the movie's overall prickliness, isn't even mentioned until an hour-and-twenty-minutes in), it was tough and ethereal and didn't offer any kind of tidy message, beyond the overwhelming sensation that mankind, as a species, spreads only devastation and ruin, in an active campaign not against each other but against the natural world itself. Based, very loosely from what I understand, on the novel of the same name by James Jones (another movie had been based on the same book, released in 1964 in Cinemascope), the movie opens with a young Private Witt (Jim Caviezel), who has gone AWOL, living amongst the natives on an island in the South Pacific. He's soon picked up by a Navy ship and reprimanded by cynical Sergeant Welsh (Sean Penn), who informs him that he will be getting into administrative trouble, but after he joins C-for-Charlie Company as a band of unlucky reinforcements for the siege of Guadalcanal. Witt is joined by Private Bell (Ben Chaplin), who has gauzy daydreams about his loving wife back home (Miranda Otto); Corporal Fife (Adrien Brody), in a role that at one time was the center of the film before being drastically reduced in the prolonged editorial process (more on that in a few); Woody Harrelson as the go-for-broke Sergeant Keck; and the eager Captain John Gaff (John Cusack); amongst others. Witt is under the command of Captain Bugger Staros (Elias Koteas, in a wonderful, heartbreaking performance), who in turn reports to the ferocious Lieutenant Colonel Tall (Nick Nolte, radiating energy) and a svelte General Quintard (John Travolta, stealing his lone scene). There's a sense of detachment, that the men making the decisions are the ones furthest away from the action. These are the plot specifics, more or less, of 'The Thin Red Line.' Soldiers storm grassy hills; some of them die. There's a veritable who's-who of stellar actors hidden amidst the grunts, too, with stars like George Clooney, Tom Jane, John C. Reilly, Jared Leto, Nick Stahl, and Tim Blake Nelson popping up for a scene or two. But this isn't really what the movie is about. It's about the spiritual war between man and nature, and this is emphasized by the multiple shots of trees, alligators, birds, and other wildlife, and by the meandering narrative which is focused less on forward drive and more on observational notions about the cosmic juxtaposition of beauty and violence. For a cast this large, the movie is largely silent, and as many movie stars that are in the film, there were just as many that filmed roles that were cut. Additionally, the movie is cocooned in dreamy narration, with a peak behind most major characters' minds (there's also a "neutral" narrator played by a non-cast member), woven together into a kind of aural poetry that lays atop the jaw-droppingly gorgeous visuals and haunting score by Hans Zimmer. The results are a war movie unlike anything you've ever seen, a far-out, consciousness-raising meditation on the nature of man and violence. It might not be everyone's cup of tea, but for the right kind of movie lover, well, you'll be in absolute heaven. Malick is one of the greatest living filmmakers, and even though he had a long absence from the game, he came back and blew everyone away – the gorgeous photography, the editorial cubism, his naturalistic way with actors; everything is top notch and go-for-broke. 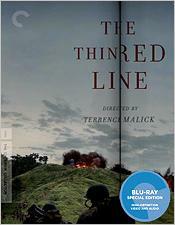 'The Thin Red Line' comes to Blu-ray courtesy of the Criterion Collection on a single 50GB disc. The disc automatically plays but halts on the gorgeous main menu. This being a Criterion release, the box is slightly squarer and chunkier; spine # 536. The disc is Region A locked. I'm feeling a little bold today, so I'm going to go ahead and say it: 'The Thin Red Line's' 1080p AVC MPEG-4 transfer (aspect ratio: 2.35:1) is the single greatest high definition transfer I have ever seen. I mean that. The bar has been raised. And now there's something to compare all other releases against. In the booklet, the following note is made about the transfer: "Supervised and approved by director Terrence Malick and cinematographer John Toll, this new high-definition digital transfer was created on a Spirit 4K Datacine from the original 35mm camera negative in 4K resolution. Thousands of instances of dirt, debris, scratches, splices, warps, jitter, and flicker were manually removed using MTI's DRS system and Pixel Farm's PFClean system." Basically, what all that means is that a whole lot of painstaking work went into restoring the movie. You really have to see this transfer for yourself. From the opening shot, of an alligator sliding into water, you are impressed by the image clarity, the amount of depth, and the detail. But as the movie goes along, your jaw drops consistently: when they enter into the jungle and every emerald-green leaf is vividly rendered; the dirt on the actors' faces after a brutal siege; and the thousands of wild life photography instances – the birds, lizards, leaves, and the coconut with the leaf jutting out of it that ends the movie. All the basics are covered too – skin tones look amazing, blacks are deep and bottomless (exemplified by a brief sequence of a nighttime attack on an airbase that was probably longer in a more abstract version of the movie), and for all that after-the-fact fussing, the movie never seems scrubbed clean or mushy in that typically DNR way. Elsewhere on the disc, the small troupe of editors said that Malick was always drawn to the footage where there was a lot of depth – with soldiers marching to and fro in the background, etc. – and this transfer totally dignifies those decisions. This transfer totally outdid every expectation I had for the release, and, as I said, has set the new high-water mark for the format. When you hit "play" on the menu, a small screen pops up that says, and I quote: "Director Terrence Howard recommends that 'The Thin Red Line' be played loud." Not wanting to disappoint Terry, I complied. And was just as blown away by the DTS-HD Master Audio 5.1 audio mix. Again, from the booklet: "The surround soundtrack was remastered at 24-bit from the original 6-track magnetic audio. Clicks, thumps, hiss, and hum were manually removed using Pro Tools HD." So, of course, a lot of work went into the mix, but again no undue amount of fussiness can be heard on the mix, just crystal clear surround goodness. And yes, while not quite reaching the atmospheric heights of the video transfer, the audio is really, really, really ridiculously good. One of the complaints about the movie when it was in theaters was that you couldn't understand which actor was providing which bit of narration. Part of this was intentional (as I stated before there's a "neutral" narrator that pops in), but it was also probably due to muddy movie theater sound. Here, you will have no problem matching the actors to the narration. It's really that good. Elsewhere, the action sequences have a hearty robustness; you will feel every mortar round, every spent shell, with a heavy bass and tons of surround activity. (This is especially true if you follow Terry's instructions and play it super loud!) There's a level of delicacy and nuance to this mix that I wasn't quite expecting, and it caught me off guard, with a droplet of water given the same care as a gunfight. And Hans Zimmer's beautiful score? My god, it's never sounded so good! Accompanying the crispness of the visuals, well, this is an embarrassment of riches. Truly. There is only one mix on the disc, but there are English SDH subtitles available. All of the extras presented here are also available on the 2-disc DVD set that Criterion is releasing concurrently. What's so interesting about the project of putting together special features for this release is that there was so much written about the movie, about how many actors Malick had either cut (like Billy Bob Thornton, Martin Sheen, Bill Pullman, Lukas Haas, and Viggo Mortensen) or severely truncated (like Brody, John C. Reilly and George Clooney). Plus, the months and months of work spent editing the movie, meant that there were probably hours of unseen footage waiting to be unleashed. The movie has an aura around it, so producing special features, you have to walk the fine line of indulging peoples' curiosity and maintaining the mystery. And they did a fine job. Commentary The commentary, which was produced by Criterion earlier this year, features production designer Jack Fisk, producer Grant Hill, and cinematographer John Toll. I was really looking for more from this commentary, but then again I really wanted to peek behind the curtain. Instead, this is a wholly enjoyable but not-exactly-illuminating look at the production and editorial process of this extraordinary film. Well worth a listen, but don't go looking for answers. Actors (HD, 33:34) This is a really amazing little documentary, with main actors Kirk Acevedo, Jim Caviezel, Tom Jane, Elias Koteas, Dash Mihok and Sean Penn. You get to hear almost every actor do an impression of Malick, which is great because he isn't seen or heard anywhere else on this disc (obviously), with each actor providing great anecdotes and stories (Tom Jane does a great job detailing how, no matter how aloof he might have seemed, Malick was always on the ball technically). This is a must-watch. Casting (HD, 17:58) This is also a must-watch. It's basically an interview with casting director Diane Critended, who shares stories of casting (all the actors that auditioned, like Leonardo DiCaprio and Johnny Depp) and is interspersed with audition footage of actors that made the cut, and some that didn't. There aren't any huge stars in the footage but I'm not going to spoil it anyway. Music (HD, 16:29) Again, nothing is ever what it seems with Malick, and in this engaging documentary, we get an extended interview with Hans Zimmer who lovingly describes the unconventional approach Malick had to the music. Among other things, Malick lived at Hans Zimmer's house for months on end and refused to describe the music literally, even though Zimmer admits that Malick understands music better than most directors he's worked with. Again, amazing stuff. Outtakes (HD, 13:30) Here it is! The treasure trove! Well, not exactly a treasure trove. Martin Sheen? Gary Oldman? Billy Bob Thornton? Nope. They're not here. What is here, is a brief and touching scene with Mickey Rourke as a sniper, some closure to the Ben Chaplin character (bonus: more Clooney! ), and a great tour-de-force scene with John C. Reilly. It's amazing how much these few minutes flesh out in the larger scope of the movie, but how much more you're still dying for! These are highly recommended, of course. Kaylie Jones (HD, 19:05) This is an extended interview with Kaylie Jones, daughter of James Jones and herself a writer. She doesn't talk much about the movie, but about her father's relationship with the war and about living with a man so obviously affected by the conflict, long after it ended. She tells a really touching story about her father carrying around the wallet of a Japanese man he had killed. Newsreels (HD, 15:18) A collection of archival newsreels show you how the Pacific campaign was being sold to American movie theater patrons. Fascinating stuff. Melanesian Chants (HD, 6:46) An unexpectedly moving special feature that I really didn't think much of, really, it's a collection of production photographs set to a record Hans Zimmer did with the indigenous singers. Trailer (HD, 2:35) The theatrical trailer for the movie. You could tell the marketing people at Fox were a little confused with what to do: not only were you selling the second big World War II movie of the year, but you had a difficult film, one that was far more elliptical and strange than most are used to, and trying to sell it as an all-star war movie. The trailer isn't all that successful but it is nice that it's included. Booklet Stuff There are two essays in the booklet – National Society of Film Critics chairman David Sterritt's essay on the film "This Side of Paradise" (well worth a read) and James Jones' own article "Phony War Films," which was first published in a 1963 issue of the Saturday Evening Post (also worth reading). 'The Thin Red Line' is in the running for "Blu-ray release of the year." The movie itself is a marvelously beautiful meditation on the psychic toll of battle, a movie that challenges all of your preconceived notions of what a "war movie" is. Terrence Malick, after two decades of absence, created a one-of-a-kind masterpiece that is still being puzzled after more than ten years later. The video is an all-time high for the format, and the audio is just about as good. The special features are voluminous and wondrous – a peek behind-the-scenes on one of the most infamous and speculated-about productions in Hollywood history that still, amazingly, maintains the film's alluring mystique. I cannot recommend this release enough. 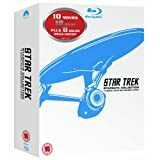 It deserves a place on any film fanatic's shelf – one that will give your audio and video set-up a dexterous workout while also challenging your personal beliefs and notions. War may be hell, but 'The Thin Red Line' is heavenly.